Carolina Tiger Rescue is dedicated to providing a permanent home to animals that have endured neglect, abuse, or other inhumane situations. We rely heavily on contributions to keep our program going strong. 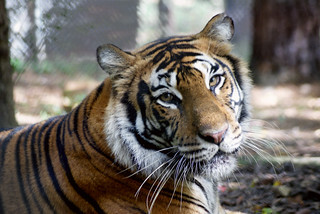 Your gift to Carolina Tiger Rescue goes straight to work, helping to save the lives of wild cats in need. 100% of your donation is used to provide our animals with the highest quality of life: large habitats, the best veterinary care, nutritional diets, and stimulating enrichment activities. Assist us in helping these animals by making a donation online, through the mail, or in person. All donations are tax deductible.